Deirdre Connolly of the popular Dublin restaurant, Peploes, on St. Stephen’s Green created this unusual, gently spicy, mackerel starter. 1. Place the potatoes in a pan of cold water and bring to the boil. Cover and cook for 15-20 minutes until tender. Drain and leave to cool completely, then cut into slices approximately 1cm / ½ inch thick. 2. Heat half the olive oil in a large non-stick frying pan and gently fry the onion and garlic for 6-8 minutes until golden brown, stirring occasionally. Stir in the garam masala and transfer to a bowl. Wipe out the frying pan and return to the heat, add the remaining tablespoon of olive oil and then sauté the potatoes until crispy and golden brown. Sprinkle over the onion mixture and fold in the fresh coriander, then season with a little salt and black pepper. 3. Meanwhile, preheat the grill. 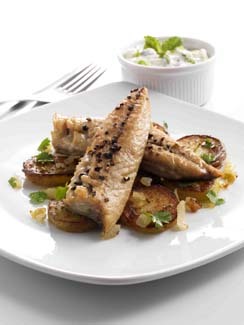 Arrange the mackerel fillets on a sturdy baking sheet and season with the cracked black pepper. Add a few drops of lemon juice, then turn them over so they are skin side up. Place under the grill for 5 minutes, then turn them over to brown the flesh which will be nearly cooked by now and should only need a minute or two. Set aside for a few minutes to rest. 4. To make the raita, toast the cumin seeds by dry frying them for a few minutes until they begin to pop in the pan, then set aside. 5. Place the yoghurt in a bowl and stir in the cucumber, spring onions, garlic, toasted cumin seeds and mint. Season with a little salt and pepper. 6. Arrange the potatoes in the centre of serving plates and place two mackerel fillets on each one. Add a dollop of the raita to serve.